Compromise Uwazurike your member was killed by Police what is your action? Movement for the Actualization of Sovereign State of Biafra, (MASSOB) has condemned the alleged killing of its members by the Police in Onitsha, Anambra State. The group stated that it was an act of wickedness for the police in Onitsha to kill two defenceless civilians who are also its members. MASSOB also said that four its members were still in hospital over injuries sustained during a clash with police along Oguta Road, Onitsha, Anambra State. 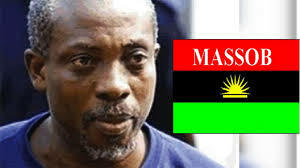 Daily Independent had reported that two members of MASSOB were feared dead on Friday after they clashed with the Nigerian Police from Inland Town Police Station at Oguta Road, Onitsha. MASSOB Director of Information, Mazi Chris Mocha, said that a team of policemen drafted from Central Police Station and Inland Town last Friday “on sighting the convoy of members of Movement for Actualization of Sovereign State of Biafra, (MASSOB) opened fire on them and killed two persons, Soronna Oke and Chukwuma Nwafor. Mocha said that four members who sustained bullet wounds included, Uchechukwu Eze, Chinecherem Oganga, Raphael Ani, and Stephen Anene, were being treated by MASSOB while the police had taken the corpses of the MASSOB members to General Hospital, Onitsha. The MASSOB spokesman said that the incident occurred near the Queen of the Rosary College (QRC) along Oguta Road as their members were returning from a meeting. He condemned the killing of defenceless citizens who had neither intention of attacking security agents nor breach public peace and urged the state Commissioner of Police to rid the force of bad elements that derive pleasure in wasting the lives of innocent Nigerians.